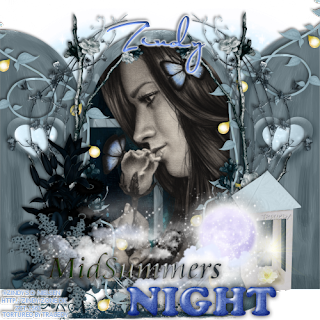 Midsummer Night Collection from Zindy & CBJ. Get it HERE. Using your lasso tool select around the inside of the window. C/P Paper 10 into the selection. Duplicate window and move above the tube layer. Using your lasso tool select the part of the tube outside the window. Selections, Delete on the tube layer. Using your lasso tool select the cross over the window. Hit delete on the top window layer. Position over the seam of the window and shutter on the right side. Position over the light vine. Position over the bottom left side of the ivy and branches. Position at the bottom of the dark flowers. Position over the bottom of the right side of the branches & Vines. Position at the bottom of the canvas. Position over the bottom of the window.